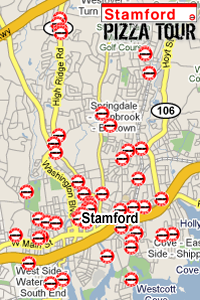 As it turns out, Pizza Tourmania is running wild all over Stamford! We've gotten some friendly blog exposure, dropped a bomb on a local cult favorite, and received quite a few e-mails as a result, asking some burning, pizza-related questions. Here's those. In theory, anyone can be a guest judge on the Pizza Tour. Thus far, we've had friends from high school, friends from college, girlfriends, sisters, and intrepid local bloggers join us. If you also want to come Touring and don't have any qualms about visiting local pizzerias carrying clipboards and scoresheets, talking about said pizzerias in painful detail at Pizza Tour HQ, and doing so with three young gentlemen who own and operate a website solely dedicated to pizza reviews, then shoot us an e-mail and come on down. Hats off to JR for actually sticking his neck out and enduring a night with the Stamford Pizza Tour. To answer this question, we've started to put together a more comprehensive tagging scheme than we've had where you can click on any tag at the end of each post (such as by-the-slice or takeout only) or in our tag list (bottom right) to bring up a filtered page of reviews for only those types of restaurants. The goal is to make our archive more manageable so that someone can consult the site when they want to eat out, or get table service, or have Greek-style pizza and read only the reviews that pertain to their specific preferences. We're just starting to populate these tags, so some might be less comprehensive than others, but bear with us. We're not exactly willing to expand past our boundaries just yet. Once we finish the Stamford Pizza Tour, we fully intend on taking recommendations for respectable restaurants outside of town with the goal of benchmarking iconic pizza places such as Frank Pepe's against our criteria and Stamford pizza as a whole. We appreciate any recommendations, local or otherwise, and will make a valiant attempt at trying out anything good enough to warrant unsolicited e-mails such as Frank's. No. No we didn't. We tend to shy away from large chains, as they lack the local flair that we appreciate so much in true Stamford pizzerias; and to be honest, CPK in Stamford is really no different from CPK in California, or CPK in Michigan for that matter. They're really just not all that unique. We have visited some smaller, local "chains" (Planet Pizza, SBC) that we've been able to justify over places like Domino's, Sbarro, or CPK, because they seem to preserve the local element despite having more than one location. In Dan's words, "California Pizza Kitchen? We're in Connecticut. Get outta my face!" Also, we appreciate the site love. Keep it coming. Ha! I had a lot of fun with you guys, and I hope to do it again soon. Thanks for linking to my site again; I love plugs more than Steven Seagal does. Sabatiello's does make a great NY style pie, and he's very accomodating of guests in his tiny restaurant. Not to worry though, he still has all the charms that made him a Kitchen Nightmare: His prices are too high, even for Greenwich, and he likes to mutter about how useless his help is. If you can get past the idea that he's not such a nice boss, the pizza is quality.